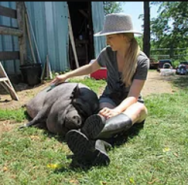 Come to visit a unique healing space for animals and humans alike. We are dedicated to educating the public about animals in need; providing humane eduation programs; and anthrozoological experiences to meet the needs of all individuals. Have we peaked your interest? Visit our website for more information!